One of the sons of Woden, Caser was the originator of the line of princes which migrated to Britain in the late fifth and early sixth centuries and founded the Anglian kingdom of the East Angles. His name is almost certainly a direct Anglian borrowing of the Latin Caesar. The Roman influence on barbarian tribes was tremendous. The twelfth century Textus Roffensis lists the kings of the East Angles right back to Woden, as does the Historia Brittonum by Nennius (shown in green after the more reliable Roffensis names). However, whichever source was being used by Nennius, it missed or had forgotten several generations, and introduced an otherwise unknown Rippa in place of Wehha. Son of Woden of Angeln. Originator of the East Angles. The name 'Tyttman' appears to mean 'teacher' or 'trainer'. 'Tyht' means 'instruction' or 'training'. The name of his son, Trygil, is much more obscure. It may be some kind of reference to the god Tiu/Tyr. Angles arrive and begin to take over control of the eastern region of Britain, part of a possible territory of Caer Went, with the earliest settlements appearing in the northern parts of that region (and later becoming known as the North Folk, modern Norfolk). They intermingle with the Saxon descendants of Roman foederati, and are quite possibly helped by the Alemannic descendants of Fraomar and his band of troops, who had been stationed in Norfolk in 372. 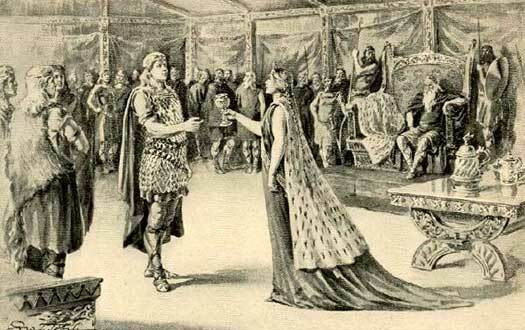 Wealhtheow is the queen of the Danes, wife of Hrothgar. Her husband appears in Norse Sagas and two Old English epic poems, Beowulf and Widsith, while she is a Wulfing, East Geat ancestor (or mother) of the Wuffingas who, within twenty years, are to be found creating their own kingdom of the East Angles in Britain. Therefore she must have some relationship to one or more of the names in this list, although it would be speculation to go any further. The Wulfingas (the 'wolf-clan' - a variation of the spelling used above) are known for their feud with the Germanic Hundings or Hundingas (the 'hound-clan')who are mentioned in Widsith - the hounds versus the wolves is classic tribal totemic behaviour. The founder of the Hundingas, the warrior Hund, is slain by the later Danish King Helgi Hundingsbane (ruling in the 520s). The feud clearly begins in Scandinavia, and probably ends when the pre-Wuffingas migrate to Britain, but they may not have been the Wulfingas before the migration. Wolf coins found in East Anglia in 2013, more than four hundred years before the Wulfingas take control, had been minted by the Iceni in the late first century AD. It seems likely that the Wulfingas take their name from some element that already exists in the territory, much like many other migrants are taking local names and adapting them. In which case, the question is what have the Wulfingas been called before their arrival in East Anglia? Son. Related to Wealhtheow, queen of the Danes? The name Hrothmund can be broken down into two parts: 'mund', a hand, and 'hroth', which seems to be from a root for benefit, happiness, pleasure, cheerfulness. It is one of the typically strange two-name names that are used by the Germans. Edward is a modern example of this practice. The name of his son, Hrype, is obscure. Perhaps it is misspelled, and should be Hraban, a raven? Son. Probably in Britain as part of the Suth Folk of East Angles. The name Wilhelm has remained in use to the modern day and is recognised in English as William. It comes from the 'helmet of will' ('will' being used in the sense of one's own volition). The name of his son is a little more problematical. Given many of the spelling insanities involved in the study of ancient names and words, Wehha may possibly be Wecca, a word from which 'wake' is descended. It might be taken to refer to someone who arouses others (to battle? ), or it may be an ironic joke because as a baby he kept everyone awake. Son. Possibly sowed the seeds of East Anglian consolidation. Son. United North and South Folk to form the East Angles. 'Wuffa' may be a loose pronunciation of Wulfa, a wolf. In some Anglian lines, especially Mercian, there is a tendency to eschew the high-flown double-part names and go with more common-style single names. Offa is an example. Remembered by later generations as Wuffa, he is the first acknowledged king of the East Angles, a kingdom that is founded more than a century after the first coming of the Anglo-Saxon peoples to Britain.